Conferences, Meetings, Association and Corporate Events | Michael P. Wasserman, Inc.
Michael P. Wasserman, Inc. has the experience, expertise, and skills to fully support your efforts planning a meeting, conference, association or corporate event of any scale or size. and entertain and impress guests. MPWI’s mission is to provide all of the services necessary to guarantee an effective, exciting, and stress-free program. The 2011 Achieving, Connecting, Thriving Leadership Conference, co-convened by the Program in Education, Afterschool and Resiliency (PEAR) at McLean Hospital and Harvard University and Boston After School & Beyond, was planned and managed by MPWI at the American Academy of Arts and Sciences in Cambridge in the spring of 2011. The conference included a leadership panel, lunchtime discussion groups and ten breakout sessions. "This was the 6th Annual PEAR Conference and the first planned and managed by the team at MPWI. The team was professional, flexible and demonstrated great attention to detail…The feedback from the attendees and speakers was glowing. We will definitely return to MPWI for future conference needs." 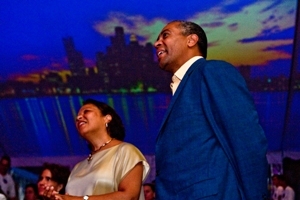 When the NGA held its annual Governors’ meeting in July, 2010, MPWI planned the closing reception on Castle Island for 1,000 guests, including 40 of the nation’s governors. A large tent with entertainment and food stations representing local fare was erected atop Fort Independence. MPWI planned and managed the event in coordination with the DCR, Governor Patrick’s staff, the NGA staff, State Police, individual governors’ security details, and the Friends of Castle Island. Bio invited a select group of leaders and sponsors to an elegant reception in the newly opened Institute for Contemporary Art in the city’s Seaport District. The venue, the first new museum built in Boston in nearly one hundred years, provided the perfect backdrop for a group of prominent architects. Music, superb food, extraordinary décor and state of the art visuals and technology assured the success of the evening. The American Institute of Architects (AIA) held its annual convention in Boston in 2008. Working with the local host chapter, the Boston Society of Architects (BSA), MPWI coordinated more than 120 professional tours that were offered to attendees during the four-day convention. MPWI also produced two major events for conference attendees. Michael P. Wasserman Inc. produced a number of social events for conference attendees including the Host Chapter Party. For this event MPWI secured the use of the historic McKim Building at the Boston Public Library for the Host Chapter Party for 2,500 guests from around the world. Honoring and complementing the rich architecture of the building, MPWI created an event that was vibrant, warm, exciting and intimate. With delightful food offerings and a wide range of entertainment options throughout the building, guests enjoyed the perfect environment in which to network and celebrate. John Hancock Financial’s 2009 Pre-Inaugural Reception in Washington, D.C.
MPWI was retained by JHF to plan and execute a Washington D.C. reception in honor of the 2009 Presidential Inauguration. Held at the historic Willard Hotel, the event was attended by more than 300 guests, including elected officials, corporate executives and nonprofit leaders.